High quality decals in perfect register; full colour instructions with reference photos; nice variety of colours and markings. Xtradecal continues to produce excellent quality decals, in particular for RAF aircraft subjects, and once again they have not let us. They have produced yet another fine quality decal sheet depicting the marking history of Canberra PR. Serial numbers XH168 and XH165. 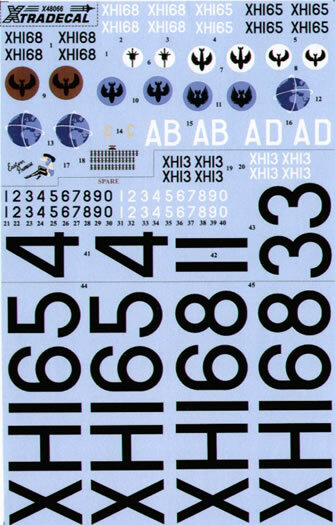 The decals are recommended for the new 1/48 scale Airfix PR.9 kits. 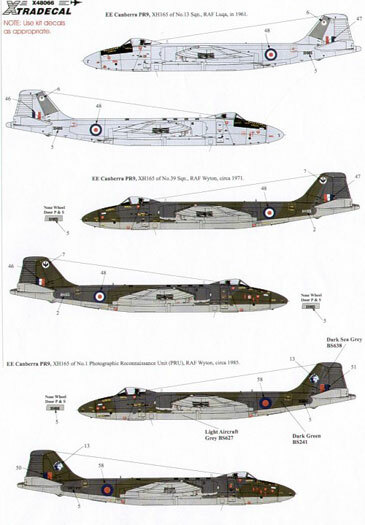 Eight colour reference photographs of the Canberra PR.9 XH131 in the Hemp and Light Aircraft Grey scheme are included in the instruction booklet. 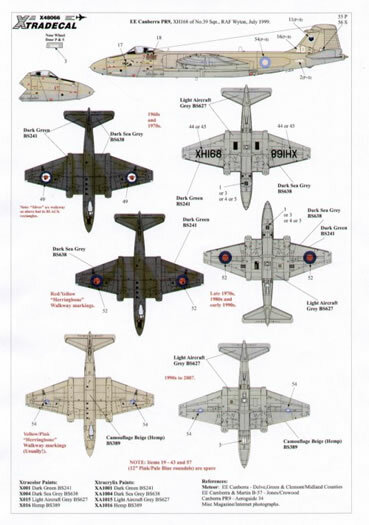 XH168 in the 1960s to 1970s scheme of BS381C:241 Dark Green and BS381C:638 Dark Sea Grey upper surfaces with BS381C:627 Light Aircraft Grey under surfaces. 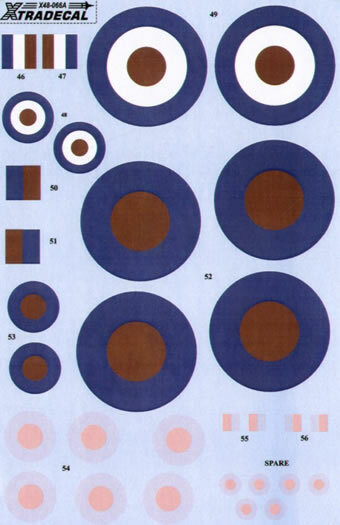 Early style roundels of red, white and blue were used through this period. XH168 in the 1970s, 1980s, and early 1990s scheme of BS381C:241 Dark Green and BS381C:638 Dark Sea Grey upper surfaces with BS381C:627 Light Aircraft Grey under surfaces. Late style roundels of red and blue were used through this period. 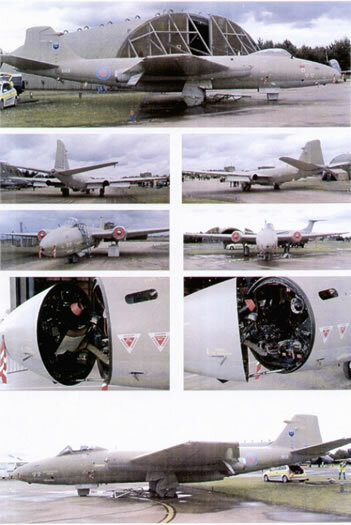 XH168 in the 1990s to 2007 scheme of BS381C:389 Hemp upper surfaces with BS381C:627 Light Aircraft Grey under surfaces. In 1992 this aircraft had late style roundels of red and blue. XH168 in the 1990s to 2007 scheme of BS381C:389 Hemp upper surfaces with BS381C:627 Light Aircraft Grey under surfaces. In 1999 this aircraft had late style roundels of pink and light blue were used through this period. XH165 in the 1960s to 1970s scheme of BS381C:241 Dark Green and BS381C:638 Dark Sea Grey upper surfaces with BS381C:627 Light Aircraft Grey under surfaces. Early style roundels of red, white and blue were used through this period. XH165 in the 1970s, 1980s, and early 1990s scheme of BS381C:241 Dark Green and BS381C:638 Dark Sea Grey upper surfaces with BS381C:627 Light Aircraft Grey under surfaces. Late style roundels of red and blue were used through this period.